The Fragrance: a fusion of french, greek and italian culture. Elegant flamingo birds, fragrant sage, wild thyme, rosemary and lavender. The Product: uplifting herbs, blended with french lavender, mediterranean mint and chinese white tea in moisturizing sweet almond oil, shea butter and pumice. A therapeutic foot soak with desert mineral salts and a variety of antiinflammatory and healing oils including peppermint, wintergreen, tea tree and eucalyptus to deodorize and freshen the feet. relaxes and comforts tired and overworked feet. Directions: Pour a handful of salts into a warm basin of water and soak feet for at least 20 minutes. Follow with an exfoliating scrub and moisturizing cream for a complete pedicure treatment. In a spa or salon, use 2 to 3 tablespoons in bath or small foot tub. This blend also makes a relaxing hand soak to soften cuticles and relax tired, overworked hands. 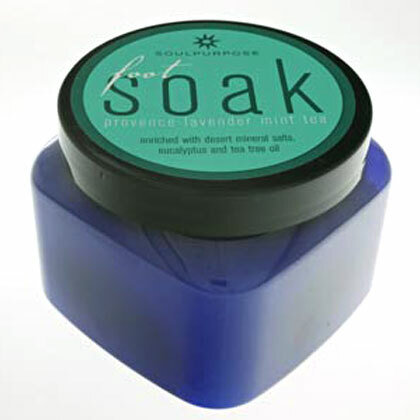 Ingredients: magnesium sulfate (mineral salts), sodium borate (desert mineral salts), mentha piperita (peppermint oil), laevo menthol (menthol), methyl salicylate (wintergreen oil), mentha spicate (spearmint oil), eucalyptus globulus (eucalyptus essential oil), melaleuca alternifolia (tea tree oil), macrocystis pyrifera (kelp) spirulina, maltodextrin (from corn), silica (from earth), fda lavender mint fragrancehydroxide, allantoin, phenoxyethanol, methylisothiazolinone, fragrance.